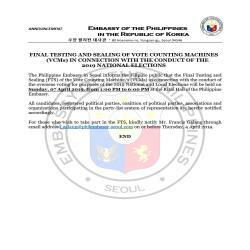 The Philippine Embassy in Seoul informs the Filipino public that the Final Testing and Sealing (FTS) of the Vote Counting Machine/s (VCMs) in connection with the conduct of the overseas voting for purposes of the 2019 National and Local Elections will be held on Sunday, 07 April 2019, from 1:00 PM to 6:00 PM at the Rizal Hall of the Philippine Embassy. 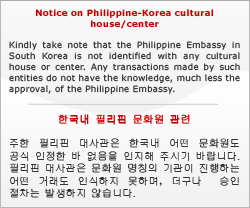 All candidates, registered political parties, coalition of political parties, associations and organizations participating in the party-list system of representation are hereby notified accordingly. For those who wish to take part in the FTS, kindly notify Mr. Francis Galang through email address [email protected] on or before Thursday, 4 April 2019.